Above is an image of Mary Shelley diligently writing. We love the composition and the use of color and shadows in this overhead shot of Shelley penning her famous novel. Shelley was heavily influenced by the art and literature of the Romantic Period. Above, director Silvia Prietov uses the only somewhat sunny colors in the entire animation to describe the Romantic’s appreciation for nature, emotion, and the purity of art. This scene starkly contrasts the otherwise gloomy house and the fierce and fiery colors of the scenes in Frankenstein’s lab. And finally, above is a delicate design depicting Mary Shelley at the window as we learn more about her life and past leading up to writing “Frankenstein”. We’re swooning over the details hiding in the shadows, the color choices, and the mood created in this scene, which invokes a pensive and rainy day. 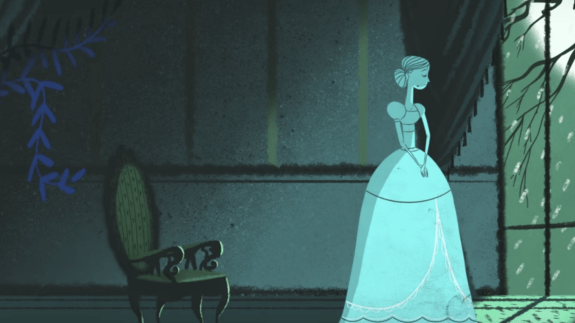 To see all of the lovely art from this lesson, and to learn about the origins of “Frankenstein”, watch the TED-Ed Lesson below. Animation directed by Silvia Prietov, designs by Andrés Felipe Landazabal. To learn more about animation, watch TED-Ed’s series of videos on ed.ted.com called Animation Basics.